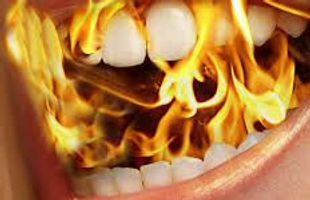 A recent literature review article stated researchers were connecting eugenol and other dental pain relievers, nerve injections, and possible damage to the lingual nerve with Burning Mouth Syndrome. Take a look and see what you think, but I have long suspected a link between dental work, oral surgery, and eventual extraction of my front teeth to the resultant burning mouth pain I have suffered for over a decade. This is not, of course, the only cause possible. There are many people with BMS who have not had dental work done near the time of onset and so other factors must be in play. When I read this, I looked up eugenol because I had never heard of it. To my surprise, I found it is found in clove oil, cinnamon, nutmeg, and bay leaf but by far the most common use of it is in dental work. When eugenol is used in dental preparations such as surgical pastes, dental packing, and dental cement, it may cause contact stomatitis (cutaneous lesions) and allergic cheilitis (inflammation of the lips). The allergy can be discovered via a patch test. They are all connected for the chronic pain sufferer and can affect us both positively and negatively. The powerful thing about this dynamic is that unlike many things we are enduring, we can make a choice. Your perspective is how you view yourself in relation to your condition. I realized I haven’t posted since the holidays, and I could easily blame that on everything that has gone on…the wedding in November of our younger daughter went beautifully and just this month they surprised us with the house they are purchasing, our older daughter’s wedding approaches (so quickly!) in May and they have begun to build a house not too far away from us, and of course the day-to-day work of a being a busy philanthropist and volunteer!